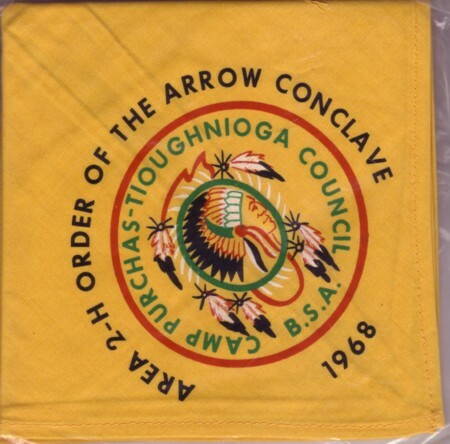 I was updating my NYS Area Conclave checklist and realized I had never posted the 1968 Area 2-H Conclave Neckerchief. The 1968 Conclave was held at Camp Purchas and hosted by Ah Wa Ge Lodge #477. As far as I know, this is the only item issued for this conclave. Was there any other items issued for this event? With this posting, the only Area 2-H Conclave that does not have a post is the 1963 Conclave. Can anyone provide scans fot the memoribilia issued for this event? The only information that I have about this event, is from Dingwerth and Jensen’s OACH, vol 1. No picture for this event, but it does state that it did meet, at Crumhorn Mt. Scout Camp. Rob, I had heard that the 1963 Conclave was scheduled but cancelled, but have never seen anything in writing that would confirm either option. In 12+ years of actively collecting NYS conclaves I have never seen anything from that event.